Small Businesses - what is considered 'small' and whats their impact? The media and and government will talk a lot about small businesses. The impact of taxes on small businesses came up during the previous presidential election. Today the economic stimulus and its impact for small businesses is another topic of discussion. With all this talk about small businesses its good to know what the government considers to qualify as a small business. Five hundred employees seems pretty big to me. When I think of 'small business' I personally think of the family ran restaurant, or the used book store, the independent painting contractor or the local corner convenience store. When I think of 'small' businesses I think of businesses with a few employees. Maybe that is just my perception though. In any case the government definition of 'small' differs a lot from my picture and can include businesses with up to 500 employees. What impact do 'small' businesses have? The SBA report "Small Business Economy for 2006" says that small businesses account for about 50% of the private sector workforce That is a pretty big impact on employment. In another publication, "The Small Business Share of GDP,1998-2004" the SBA states that small businesses account for 50% of our country's GDP. The census has stats for 2004 showing the breakdown of employment and revenue figures for different size businesses. 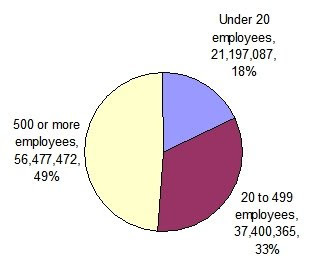 If you look at those numbers a bit closer you find that 89% of all businesses are under 20 employees. Those businesses employ about 21.1 million people which is 18.4% of the workforce. Their payroll is $659 billion or 15.5% of the total payroll. Revenue for those firms not available yet for 2004 but in 2002 it was $3.12 trillion or 14.2% of the total revenue of all firms. If you look at the firms with less than 100 employees then they employ 36% of the total workforce. If you break down the small businesses tracked by the government then you'll see that those businesses with under 20 employees account for only about 20% of the total economic impact. The bigger 'small' businesses that are 20-500 employees in size account for 30% of total economic impact. Businesses over 500 people which are too big for the government class of 'small business' account for nearly 50% of employment and over 50% of payroll and business revenue.